Lately I have been rocking so much denim (ain't nothing wrong with that) that I feel like it's time to change things up. When I saw this skirt by Betty and Veronica, I knew I need it in my life. Rachel Antonoff created the Betty and Veronica Collection which orchestrates a real life comic strip with beautifully illustrated backgrounds by Dan Parent, scripted by Lena Dunham. 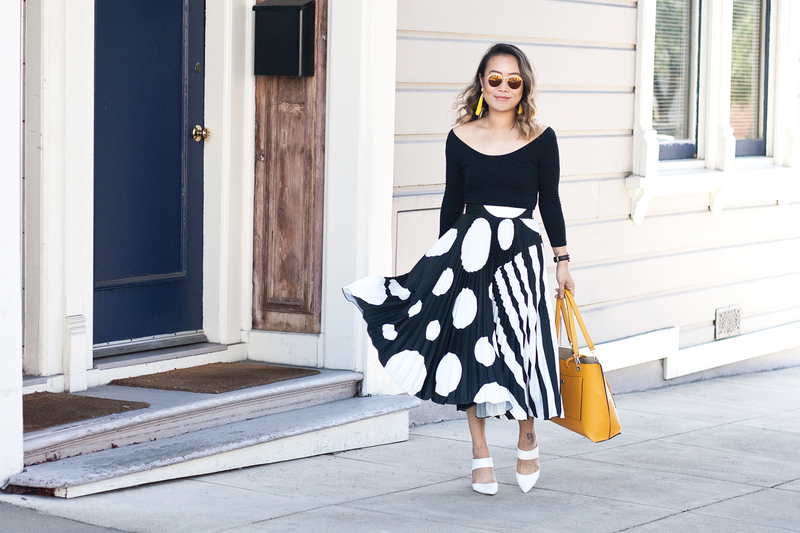 This black and white pleated skirt with a mixed print of dots and stripes is my absolutely favorite. So chic and so fun. With a statement piece like this, you really don't need much so I simply styled it with a black top. And since it's almost summer time, I added this gorgeous mustard leather purse by Henri Bendel and these fun tassel earrings for a pop of color! Dots and stripes pleated skirt c/o Betty and Veronica. Worth Ave Tote c/o Henri Bendel.